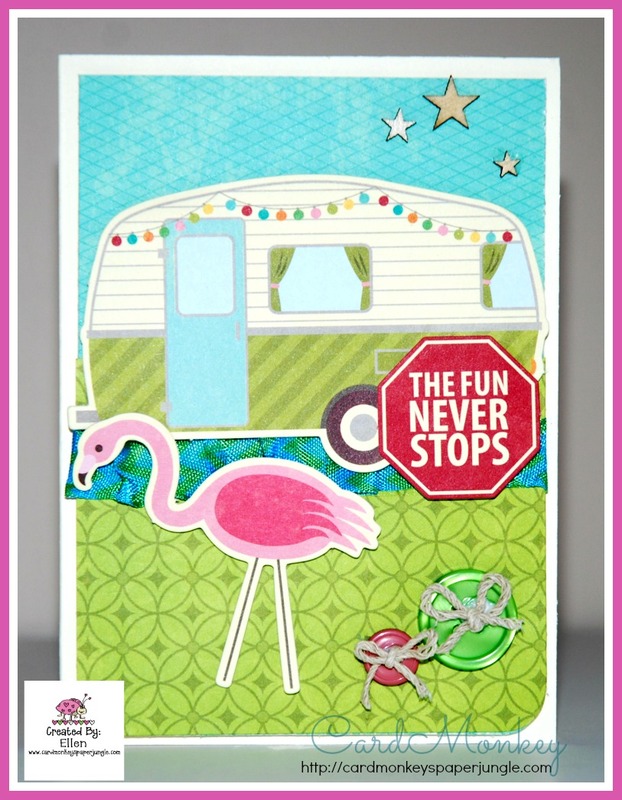 CardMonkey's Paper Jungle: Camping: Where the Fun Never Stops! Ahhh, summertime! Can you hear the cicadas chirping, screaming!, in your backyard trees? That's how I know it's August. That, and the humidity for sure. Some are packing up their families into trailers and campers and heading off for cooler, scenic climates. Me? Well, let's just say roughing it is not my style. I came >>>this close<<< to going camping once when I was a Girl Scout leader, but successfully avoided it. Phew! 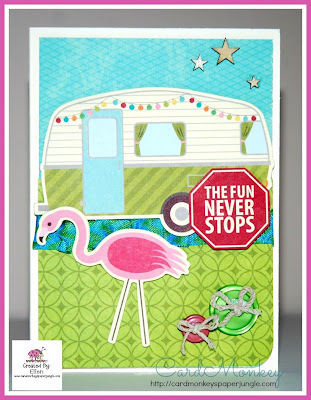 But the theme this month over at Jillibean Soup's Card Kitchen card club is travel and specifically camping, and features these cute, cute papers and die cuts. I ramped up the card >>CardMonkey Style<&lt by adding some chevron-printed turquoise and green ribbon. Whatever the rest of your summer brings, make it fun, will you? Oh my goodness...LOVE LOVE LOVE!!! The colors, the Fun Footz, everything just goes so well together!!! Another fab creation!! I wish I could just get in that camper and hightail it out of life. LOL So cute! !